Ray made all his creatures by hand. His stop motion monsters have a dream-like quality that makes them more interesting to me than a lot of the "realistic" CGI monsters you see today. The trailers are melodramatic, but that's part of the fun. Perseus wants to save Andromeda (who he just met) from the Kraken. If he saves her, he also gets to be king, so I don't think he's doing it just for love. The Fates tell him the only way to beat the Kraken is to get Medusa's head! 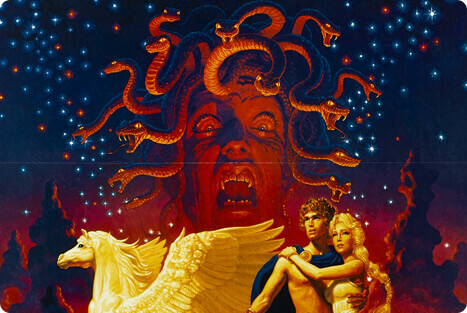 Be sure you watch the original 1981 version, not the 2010 remake with its supermodel Medusa and personality-less Kraken. This movie inspired my first novel, The Monster Realm. A spaceship returning from Venus crashes near a small fishing village. The ship carries an unborn creature, which hatches into the Ymir, one of the most adorable monsters of all time—until it starts to grow! As humans hunt the stranded Ymir, it starts to fight back, really just to protect itself. 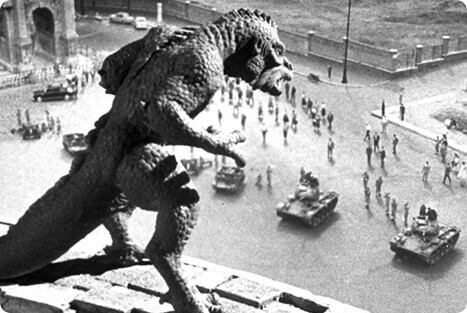 Running for its life, the poor Ymir finds itself trapped in a showdown at the Colosseum in Rome. Sinbad and Princess Parisa are about to be married, bringing peace to their two kingdoms. But before the wedding, the evil wizard, Sokurah, shrinks Parisa down to the size of a doll. To reverse the spell, Sinbad needs the eggshell of a roc, which can only be found on the island of Colossa (great name!) Needless to say, he's going to have to go through a lot of adventures to get that eggshell. Jason and his crew set sail to find the legendary golden fleece. Along the way, they'll battle harpies, Talos the giant bronze statue, living skeletons, and the seven-headed hydra who is the guardian of the fleece. The effects in this movie are great. I love all of Ray’s creations, but I think his living skeletons are among his best. In Africa, a little girl named Jill takes care of an orphan gorilla. Years later, Jill and the gorilla (Joe) are discovered and taken to Hollywood. But Joe has a hard time adjusting to city life. He innocently causes lots of trouble, and a court orders him to be put down. It's up to Jill to come up with a plan to save her best friend. This is one of Ray's earliest films, and one of my favorites. According to legend, the three pieces of a golden puzzle will reveal a map to the Fountain of Destiny—where you can gain eternal youth, invisibility, and unimaginable wealth! As Sinbad races to find all three pieces, he'll fall in love with a slave girl named Margiana (who wears the tightest shirt in the ancient world), fight an evil wizard, and have an exciting duel with the six-armed idol Kali. During the American Civil War, a group of Confederate prisoners escape on a hot air balloon which carries them to a mysterious island. They're attacked by a giant grab and chased by bees the size of elephants. Someone has been genetically manipulating the creatures on this island—but who, and why? A nuclear sub is mysteriously attacked in the Pacific. Other attacks follow, and we learn that a giant octopus has risen from the deep. And by giant, I mean Godzilla sized. The navy tries to bomb it out with depth charges, but the monster makes its way to San Francisco. These monsters in the 1950s were usually created by nuclear radiation, so it's ironic they decide the only way to kill it is to use an atomic torpedo! Princess Farah tells Sinbad that her brother has been transformed into an ape by the evil witch Zenobia. This sounds like a quest waiting to happen! Giant bees and violent walruses, a troglodyte and sabre-toothed cat—those are just a few obstacles between Sinbad and the magic shrine where a cure for Farah's brother can be found. But wicked Zenobia, able to transform into a sea gull, is watching their every move—and following close behind! Nuclear testing in the Arctic Circle wakes giant Rhedosaurus (who was actually an inspiration for Godzilla). It heads across the country to the east coast, causing all kinds of damage. The military attack, but the creature's blood contains a terrible prehistoric virus which is infecting New York. Finally the monster is driven to Coney Island for one of the greatest showdowns of all time. This movie was based on The Fog Horn, a great story by Harryhausen's lifelong pal, Ray Bradbury. Dr. Marvin, a scientist, is in charge of Project Skyhook, a program to launch research satellites into orbit. The satellites keep falling back to earth, and Dr. Marvin can't figure out why—until a flying saucer chases him and his new bride along a desert road. Earth is being invaded, and our technology is no match. It's up to Dr. Marvin to figure out a way to stop the saucers before it's too late. This is the ultimate documentary on Harryhausen's work! Peter Jackson, James Cameron, and Steven Spielberg are just a few of the filmmakers who pay tribute to Ray. Not only is this a great bio, but you get to look behind-the-scenes at Ray's process. Plus, it's a lot of fun!